Nanda (Skt. Nanda; Tib. དགའ་བོ་, gawo, Wyl. 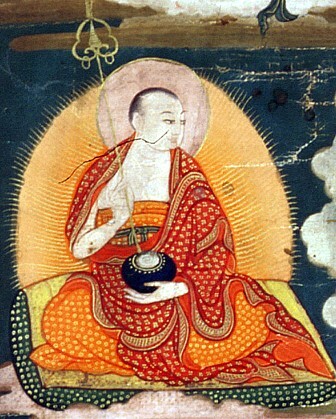 dga' bo)—a half-brother (and also cousin) of Buddha Shakyamuni. He was the son of king Shuddhodana and his second wife Mahaprajapati (Skt. Mahāprājāpatī), who was the sister of Mayadevi, Buddha's mother. At first he was strongly attached to his beautiful wife to be, but later became a monk and attained the level of an arhat. Patrul Rinpoche, The Words of My Perfect Teacher (Boston: Shambhala, Revised edition, 1998), pages 95-96. ↑ It should be noted that Padmakara's translation of the Tibetan word gcung as cousin is not correct; gcung means younger brother. This page was last edited on 4 November 2018, at 05:42.